A recent addition to APT’s GroundBreaker range of Gold Mining products is a non toxic, recyclable, natural compound, developed and tested in house, which we have named ‘GoldFixTM ’. The GroundBreaker range is designed to be mercury free, and is widely used, particularly in places where environmental impact is a consideration. Mercury has, in the past, been the method commonly used to recover the maximum amount of elemental gold, being regarded as cheap and simple. However, because of its toxicity, in terms of its toll on human health and environmental pollution, it proved anything but cheap. Now APT has produced a safe, efficient, cost effective alternative to mercury. GoldFixTM is a natural compound which is recyclable and reusable. It is non toxic to humans and does not impact negatively on the environment. The APT gold recovery process, in which GoldFix is used, takes you from concentrate to smelted nugget in six simple steps. At the end of the process, the gold has been recovered and you are left with the pure gold nugget! GoldFixTM for gold recovery works with APT’s existing GroundBreaker solutions, which include the GoldKacha, GoldKonka and GoldMasta. It provides the finishing step that bridges the gap between concentrates and gold ore bullion. Even the smallest amounts of gold can be captured efficiently. Gold Alluvial Plant On Sale, Fully Assembled and Ready To Run! This gold alluvial plant on sale boasts simple-to-use washing, scrubbing and mineral recovery components. It can process 6-10tph of alluvial/elluvial material, and although this particular one shown in the image below is for gold recovery, this plant can also recover a variety of minerals by simply having the upgrader changed, should you wish. The mineral recovery plant comes fully assembled and is installed and commissioned by APT professionals, ensuring a smooth and painless mining start-up process for the client. A concrete foundation is required on the site before the plant arrives, as well as a 1 meter high concrete wall and brick plinth. This allows for a neat plant set-up and optimizes the use of gravity as no chemicals are used or required. APT endeavors to be as safe in mining as possible, for both our clients and the environment. So how does this modular mining plant work? Firstly, the alluvial/elluvial material is fed into the scrubber via the feed trough and is then disintegrated into a pulp. The pulp is then fed by Gravity into 3 GoldKacha’s where a batch concentrate is obtained. The concentrate is then cleaned up on the GoldKonka and smelted in the P100 electric furnace to produce the final gold bullion. The RG100C plant is in-stock, fully assembled and sold as is, with all of the aforementioned components. The image below is of this exact plant, so this gives you an idea of what your mine will start out as. We do have an idea on how you can expand this plant financially and grow your mine, so feel free to contact us if you are interested in funding your own project. APT has begun 2016 by establishing, in association with their active agents in East Africa, Borassus, a number of 100% mercury free gold processing plants. The efficiency of this particular method of processing is attracting intense local interest from local artisanal miners. Interested miners have queued for as long as 48 hours at demonstrations of the plants and process. Opinion has been strongly expressed by these miners that the recovery rate is far higher with APT’s 100% mercury free, processes, than from traditional methods. The plants used in the process consist of simple dry or wet milling utilizing a GoldKacha Concentrator and a GoldMasta sluice, to optimise free gold recovery. Concentrate recovered by this process, can then be upgraded by using a GoldKonka, finally smelted using a field smelter, which is run off the same power source. Following the success of the East African demonstration of this process, APT plans to launch this process globally. The significance of APT’s 100 percent mercury free process in an increasing environmentally fragile world cannot be over stressed. APT welcome enquiries from all interested parties included listed mining entities with environmental concerns, philanthropists, environmentalists, small and large mining concerns. An existing APT equipped 100% mercury free gold proceeding plant site. Each site can service 200 to 300 artisanal miners. Currently a 48 hour waiting line. Artisanal miners determined to get better recovery are prepared to wait. This waiting interval is being addressed and centres are currently being expanded and replicated regionally & rapidly. APT have long since realized that there needs to be a solution for listed juniors. More than ever before the hurdles necessary to bring a new mining project on line, or to expand an existing one are daunting. Listed Juniors deserve a medal for their efforts and a good deal of recognition is owed for the often thankless task. There are many boxes to be checked, one of which is the plant; its design, its cost and the efficacy of the result. Nothing endorses a project more firmly to its investors than production on schedule, or even ahead of schedule. APT realizes this and our plants have been brought into production for small to medium mines at literally break neck speed. For example, a 20tph gold plant was recently designed and built in just 14 weeks. It was then shipped to site and once there was erected, commissioned and in production in just 4 days! In another case a large 40tph gravity tower for gold recovery was erected on site in just 6 days! Through rigorous R&D, our designs have been evolved to allow for a single plant that can treat the softer upper oxide material and then accommodate more competent rock from the transition and deeper levels. Called Combo Plants, these units can accept up to 50% of the feed tonnage as hard competent rock and are ideal for a startup. Modules can be added as necessary to tailor the plant progressively to a deep level unit, for example by the addition of flotation and cyanidation. The breakthrough for the Juniors is that APT have progressively expanded this tried and proven capability to a larger plant size. Our latest plant, at 120tph capacity is in fact a Combo Plant and clearly demonstrates APT’s specialist knowledge in this field. Large engineering companies frequently encounter difficulty designing their products downwards, it is not as easy as it sounds. APT on the other hand has had no trouble engineering upwards and we come from a broad base of experience of over eighty plants to grow from. The ability now exists for a Junior Mining House to bring a project on line at reasonable cost ahead of schedule whilst reserves are expanded to justify further investment. APT would be involved throughout the entire process from testwork through to implementation of the final modules as the project matures. This can all be designed from the outset for ease of forecasting and financial planning. APT: a perfect solution for listed juniors. The latest trend in the mining and minerals industry is a move towards the design and construction of modular or containerised laboratories in order to ensure that the client has at his disposal a full scope of capabilities for the fast turn-around of accurate and reliable data, explains Gary McFarlane, business development at APT Processing. These laboratories (labs) are designed and operated in accordance with global quality standards, internationally recognised methods and proficiency programs that include benchmark comparisons with external labs. As more Junior and emergent mining companies are entering the exploration and mining industry- they are frequently dealing with smaller exploration areas, hence they need fast turn-around to maximize on site value, states McFarlane. Most mining activities are carried out in remote areas far from traditional laboratories, and thus require samples to be shipped across borders or transported hundreds of kilometres for analysis, which tends to be costly and time consuming. Modular or containerized laboratories now offer a number of benefits over the traditional laboratories as they can be moved at a relatively low cost, andare quick to bring on-line. “Flexibility to react quickly is now hugely important in the new mining industry. Good decisions are made not only upon good information, but in time with changing events. containerized, convenient, fast analyses make a great partner to nimble slick operations”, adds McFarlane. whether on-site or off-site, it is imperative that one knows what elements is looking for, and if it is gold, then a system will include a bLeG with an AA. if it is base metals, then Xrf can be specified. for the cyanidation plant option, a carbon ashing furnace is also included, however if the amount of samples is large, or a programme needs to be accelerated, dual units can be ordered, placed together and then separated later for deployment at different sites, explains McFarlane. APT recently installed a field Assay Laboratory at the CATA operation in Tanzania, enabling exploration to proceed while the rest of the process plant is being installed. APT’s laboratories include analytical tools such as Atomic Absorption, X-Ray Fluorescence (XRF), as well as activated carbon analysis for monitoring cyanidation systems. The facilities are not just equipped for analysis, but also include the relevant metallurgical testing capability. They therefore also provide information upon expected extraction, a vital part of the equation. This additional capability makes the units ideal for ongoing monitoring and efficiency maintenance of APT plants or existing plants, concludes McFarlane. 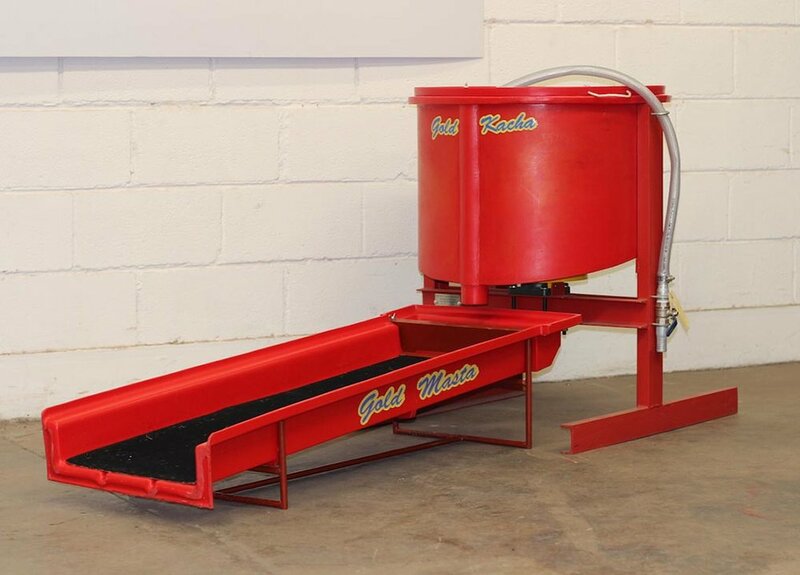 As part of APT's GroundBreaker Division, the GoldMasta sluice was developed as an entry level device for artisanal miners to begin, and advance production in an efficient, affordable manner. “The engineering, design and rigorous test work coupled with the implementation of the latest technology has resulted in maximized recoveries and the production of a higher grade concentrate”, states the APT’s Director of the GroundBreaker Division. He continues, “the surface matting is easy to clean, making for a quick harvest cycle”. The GoldMasta is made from a durable, non-corroding material and production can be commenced as soon as it arrives on site. The GoldMasta can be relocated with ease and a power outlet is not required. This allows for use in remote areas, often a requirement for exploration modules as you need to follow your mineral resource wherever it leads. To obtain an even higher recovery, two or more GoldMasta’s can be placed in a series. This module was also engineered to work in combination with our GoldKacha concentrator (as seen in picture below), resulting in a compact package with extremely high recovery. If the full potential tonnage of the GoldKacha is required, two GoldMasta’s can be used in parallel on the tails, which you can just make out on the right of the picture below. We also encourage you to read our article on the GoldKacha here, as it shows more on how it operates, why you need it and just simply- more on what it is! APT do carry out demonstrations on all of our GroundBreaker plants in order to show exactly how they work, so please let us know if you are interested in us doing one in your area. We would be happy to oblige! If you are looking to become part of the APT team and be a distributor for the GroundBreaker range, please email us on info@aptprocessing.com and we'll let you know the process and benefits involved.